Community members of Northampton and the greater Pioneer Valley are encouraged to take part in this lighthearted and fun social experiment. 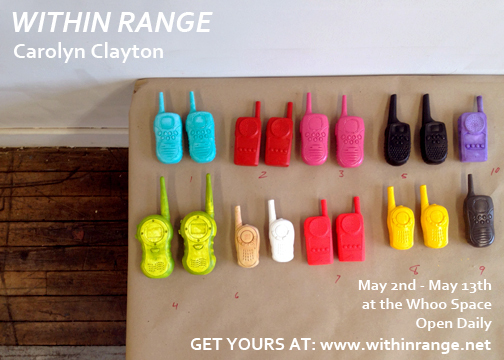 Clayton presents handcrafted walkie-talkies. There are 50 pairs, each a unique combination of color, shape and style; each piece has a twin, reflecting the two-way nature of walkie-talkies. The walkie-talkies are all individually priced at $20. Upon purchasing a piece, one agrees to participate in a platonic matchmaking project. Over the twelve-day duration of the show each walkie-talkie owner will be scheduled to rendezvous at the gallery with the owner of the matching walkie-talkie. At this point they may retrieve their purchases while participating in a face-to-face conversation with their partner over free coffee, tea and pastries. 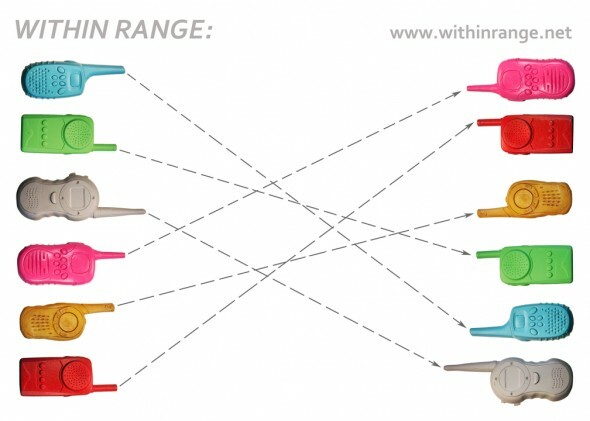 To purchase a walkie-talkie in advance and secure a spot in the project please visit www.withinrange.net. Walkie-talkies may also be purchased on site. In a world powered by technology- the Internet, Facebook, smart phones, video chatting, and online dating, WITHIN RANGE is an opportunity to have a pure human encounter with another person regardless of age, ethnicity, gender, social status or romantic intent. The cast walkie-talkie, although non-functional, will act as a memorable symbol of each encounter, adding a personal and symbolic feature to owning a work of art. Clayton graduated from Carnegie Mellon University in 2009 and has since completed a residency at Vermont Studio Center in 2010. She has exhibited her work in Easthampton, Pittsburgh and New York City. She currently lives in Northampton and maintains a studio in the Eastworks building in Easthampton MA. She is also a C3 collective member.